Neo-liberalism through marketization, privatization and globalization was pursued as an ideology by the developed nations during the last three decades or so to control and influence the global economy including that of the developing nations. In our context, globalization as a process to integrate our economy with that of the world got initiated in the early 1990s after the Indian State depleted its resources and mortgaged the reserves at its command. We had no option but to open our economy to the market economic forces. However, in certain quarters, it is argued that globalization as a phenomenon and process, was likely to bring in the social transformation of the Indian society by affecting our social institutional and organizational arrangements while there were others who thought that because of socio-cultural diversities inherent in our social structure, globalization might have limited penetration in our agricultural and bio-massed society. The present book is an outcome of the papers presented and deliberations made in a seminar on 'Socio-Cultural Diversities and Globalization' by eminent scholars drawn in from different disciplines on these two divergent perspectives on globalization. Shiv R. Mehta, a former Baba Prithvi Singh Azad Professor in Sociology, at Panjab University, Chandigarh, had a rare distinction of being a Fellow at the Indian Institute of Advanced Study, Shimla, to research on “New Understanding of the Indian Society: Encounters with Sociology” between 2004 to 2007. Before joining Panjab University, Chandigarh, Professor Mehta was a Sociologist and Head of Evaluation in the World Bank Project on Rural Development in Mauritius for nearly five years. He also had a stint with the World Health Organisation, SEARO, New Delhi, as a Short Term Consultant, on 'Teamwork in Primary Health Care' in 1984. Professor Mehta has published extensively and his major publications include Emerging Pattern of Rural Leadership (1972), Social Development in Mauritius (1981), Rural Development Policies and Programmes (1984), Society and Health (1992), Communication and Development (Ed. 1992), Poverty, Population and Sustainable Development: Essays in Honour of Professor Victor S. D'Souza (Ed. 1997), Dynamics of Development (1999), Social Transformation of an Island Nation (Co-authored with Dr. Rani Mehta, 2009) and New Understanding of the Indian Society (IIAS, Shimla, 2010) (in press). Neo-liberalism through marketization, privatization and globalization was pursued as an ideology by the developed nations during the last three decades or so to control and influence the global economy including that of the developing nations. In our context, globalization as a process to integrate our economy with that of the world got initiated in the early 1990s after the Indian State depleted its resources and mortgaged the reserves at its command. We had no option but to open our economy to the market economic forces. 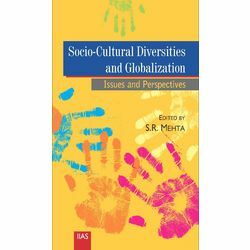 However, in certain quarters, it is argued that globalization as a phenomenon and process, was likely to bring in the social transformation of the Indian society by affecting our social institutional and organizational arrangements while there were others who thought that because of socio-cultural diversities inherent in our social structure, globalization might have limited penetration in our agricultural and bio-massed society. The present book is an outcome of the papers presented and deliberations made in a seminar on 'Socio-Cultural Diversities and Globalization' by eminent scholars drawn in from different disciplines on these two divergent perspectives on globalization. Shiv R. Mehta, a former Baba Prithvi Singh Azad Professor in Sociology, at Panjab University, Chandigarh, had a rare distinction of being a Fellow at the Indian Institute of Advanced Study, Shimla, to research on “New Understanding of the Indian Society: Encounters with Sociology” between 2004 to 2007. Before joining Panjab University, Chandigarh, Professor Mehta was a Sociologist and Head of Evaluation in the World Bank Project on Rural Development in Mauritius for nearly five years. He also had a stint with the World Health Organisation, SEARO, New Delhi, as a Short Term Consultant, on 'Teamwork in Primary Health Care' in 1984. Professor Mehta has published extensively and his major publications include Emerging Pattern of Rural Leadership (1972), Social Development in Mauritius (1981), Rural Development Policies and Programmes (1984), Society and Health (1992), Communication and Development (Ed. 1992), Poverty, Population and Sustainable Development: Essays in Honour of Professor Victor S. D'Souza (Ed. 1997), Dynamics of Development (1999), Social Transformation of an Island Nation (Co-authored with Dr. Rani Mehta, 2009) and New Understanding of the Indian Society (IIAS, Shimla, 2010) (in press).